Harry Barry, the new Lundbeck puppet? AH Harry – are you the new Lundbeck puppet? Exactly how many Doctors and Psychiatrists are on Lundbeck’s payroll? I must say Harry, you really disappoint me, I thought you were a good guy! Have you moved over to the dark side or do you actually believe the pharmaceutical tripe that Lundbeck are feeding you? An article today in the Irish Examiner states…Virtually everyone who presents with depression gets a pill. As severe depression is diagnosed in only 5% of cases, this means that 95% of patients are being given anti-depressants contrary to guidelines. Basil Miller, a collegue of Dr.Corry’s, and who incidently is not being paid by any pharmaceutical company, said it is clear from the data that anti-depressants are grossly over-prescribed. This is largely down to inappropriate prescribing. In relation to anti-psychotic drugs, usually prescribed for schizophrenia, bipolar disorder or to manage psychosis, former mental health inspector Dr Dermot Walsh maintains that second generation anti-psychotics, such as the current most commonly prescribed olanzapine (better known as Zyprexa) — cause “substantial adverse effects, compromising life expectancy in psychiatric patients”. Dr Walsh said that there is emerging evidence that some changes in the structure of the brain, previously thought to be the consequence of the schizophrenic process, may actually be treatment-related. Back to Harry – Harry was one of three experts on the Late Late Show (Irish TV show) the night we were on, a few weeks after Shane’s death. We wanted people to know about the dangers of Lundbeck’s Citalopram. So tell me Harry, are you a new recruit or were you there on behalf of Lundbeck? Were you there as an expert to help awareness or as a representative for this drug company? You seemed like a nice guy Harry but you never mentioned working for Lundbeck, the company that manufacturers the drug that I’m blaming for Shane’s death, Cipramil/Celexa. Dr. Barry says, “Common anti-depressants in 1990s were Prozac, he says. Now Lexapro, which he describes as a more modern and powerful form of Prozac, is more commonly prescribed”. Lundbeck also manufacture Lexapro. Lundbeck and Harry again. The 2011 Lundbeck Mental Health Barometer indicates that more than two people in every five would not want to know if a loved one were experiencing major depression. The ‘barometer’ also showed that 70 per cent would find it difficult to discuss depression with a doctor. According to Dr Barry, it was “an extremely useful indicator of how we view major depression”. 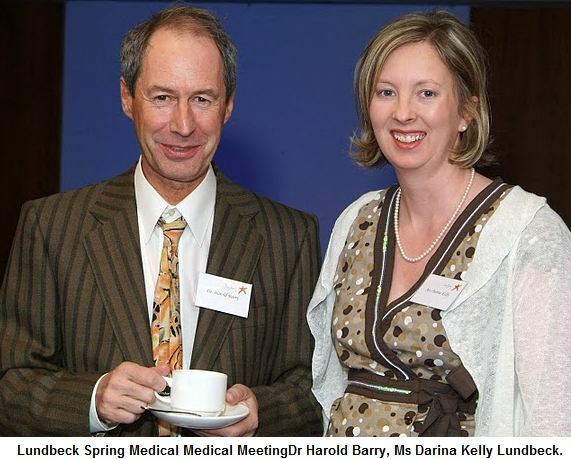 Harry and Lundbeck, The Irish Times. Harry even gets a mention in Lundbeck’s “Mind Yourself” leaflet. Dr Harry Barry has some hard-hitting advice for people in the grip of a depressive illness at the launch of the Lundbeck Mental Health Barometer. He was the quest speaker for Lundbeck. Lundbeck’s “Lean on me” website is also sponsored by Aware. Coincidently Dr, Barry is a board member of Aware, the Mental Health Charity. So why is a mental health Charity and a pharmaceutical company that manufacture antidepressants (with known suicide risks), so closely involved? Why do we not have full disclosure for the payments that Doctors and Psychiatrists receive from the pharmaceutical industry here in Ireland just like in the U.S, Dollars for Docs? Now that would be very interesting! Incidently, we have a meeting in the Lundbeck offices of Valby Copenhagen, in 2 weeks, 2 years since this happened to our family and my lovely son. That should be interesting…will keep you posted! Previous postProzac, Eli-Lilly and bribing the Swedish government. Next postThe Irish Medicines Board €27 million funding from the pharmaceutical Industry. Not only do they not know exactly what they are treating – they are now rolling out a kiddie-type toy that, once again, is based upon theory and not science. **Goes to loft to dig out 1970’s Chemistry Set. Mr Barry, it would appear that you have left a paper trail. The Irish hound is pretty damn good at sniffing. I don’t need to comment though, the post speaks for itself. I can understand why a doctor would recommend an antidepressant if he believed the drug company propaganda that their pill worked better than their competitor’s. It gets murky when you contemplate why a doctor chooses one SSRI over another. Does it depend on which drug company gets to him first? I’m looking forward to hearing the results of the meeting in Denmark in a fortnight from now. Don’t let them try to give you the runaround! I don’t understand how a GP, is an ‘expert’ in mental health, isn’t that what psychiatrists do? Sorry truthman, I actually live in Ireland and that was a rhetorical question. GP’s are no more experts in mental health than you or I are. Unfortunately they don’t have to refer to a psychiatrist before prescribing psychoactive medications, if they did we wouldn’t have the massive overdiagnosis of depression and mental health disorders that we do. My comment was directed at Dr Barry’s arrogance in proclaiming himself an expert in this area. If as a GP he claimed to be an expert in cancer or heart disease he wouldn’t be tolerated by the medical community or the media but because the whole ethos behind GP’s being able to diagnose mental health issues is to treat them with medication and because this is lucrative for all involved he gets away with it. Wow, I came on the web to see if anyone had exposed this Dr Barry. My o my. He is not a psychiatrist but acts outside his qualifications. He could not spot suicide if it jumped up and bit him on the nose. However from our experience he is a dangerous “doctor” who acts in psychiatric capacity, telling children to have their breakdowns and get over it, blaming them for the father’s violence.?? He sides with domestic terrorists who point guns at children,s heads when their dinner is not on the table at 6. Lovely man really!!!!!! Not. He blames victims for their own abuse.I have just been to psychologist re his abuse of me. I carried it for 20 years not fully understanding it until recently. Harry has also never told the world where he learned about how to deal with those who are suicidal.. Why Harry?? This “doctor” prescribed massive quantities of narcotic medications to my father for over 20 years These drugs were on a repeat prescription for years and years. He only saw my Dad when we the family sought “help” which of course Dr. Barry “helped” by prescribing more and more meds. We did not know he had no experience/training in mental health. Doctors in St. Bridget’s Ardee could not believe the amount of drugs my Dad had been on. They were shocked. The result? We lost our Dad to a legally prescribed drug induced haze sometime in 1980 and now? We have a demented 78 year old drug addict roaming the house seeking more and more drugs. My 80 year old mother has to contend with this. My bipolar/aspergers father got NO treatment other than more and more and more drugs. I repeat NO TREATMENT. Dr. Harry Barry was my Dad’s drug pusher. Anne, I direct this to you – but also of course to Leonie – I am so sorry that your father suffered so much drug pushing for pharma by this absolutely mad disgraceful man who happens to be a doctor – today – July 8th 2015 – I have listened a little to this same Dr Harry Barry (RTE1 after 10.30 Radio) and he does not give up – he continues that same tone of repeating what grieving parents tell him and that is his abusive platform – he quotes phrases from bereaved parents as his opt out clause of “do not question who I am or who I work for” …quotes from one parent “we are lost in nameless pain” – How dare this man not be honest- how dare Dr Harry Barry breach patients’ confidentiality by quoting their pain – why does he not tell those parents about the side effects of the suicide ideation drugs he has “pushed” on their young children?